Making digital black and white conversions is easier with a little understanding of how color has historically been recorded and manipulated with film and filters. I was doing some updating of the Lower Owens River Project page on my personal website and came across this old blog post from way back in 2007. I think it is worth reposting here. Back then I didn't do much digital work at all, and most everything was 8x10 contact prints on Kodak Azo (scroll down for a laugh at my youngster self with the green monster). Over the next few months I'm going to be drum scanning and making much larger Piezography prints of lots of this older work. I plan on making a series of posts about the process and how the experience and prints compare to the original darkroom prints. 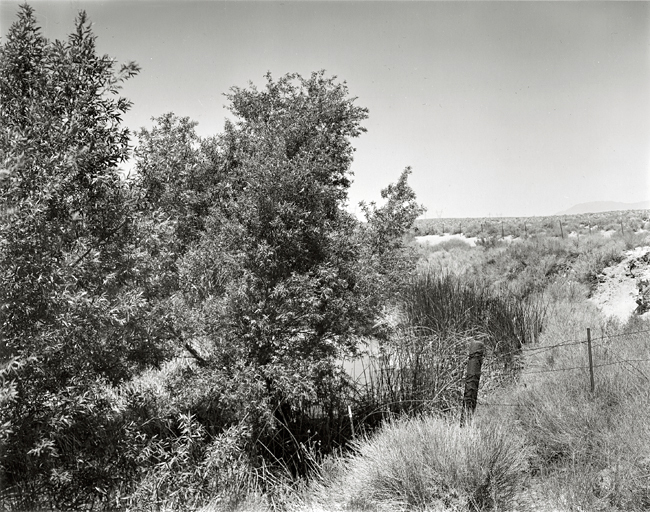 After just finishing some printing and scanning of more photographs from my last trip to California, I was talking with someone about photographing the Lower Owens River Project. I mentioned that part of what I am doing documenting the changes in the landscape. But along with that, I want to make personal records of what I feel makes this place so special. That thought was reaffirmed earlier this evening as I was reading an essay that, on the surface, was a defense of straight photography which draws its inspiration from the natural world. Some people believe, because that specific "genre" has been so thoroughly explored, there is no possibility for originality by working in such" traditional" ways. The essay I was reading earlier tonight was born from that very argument. Originally written in 1976 by a graduate student at RISD, and to substantiate his point of view, he included ideas about the nature of art, originality, and expression—some of which are the best I have ever read. There are several other articles and essays here that I should to have enough time this week on which to read and reflect. But, in the mean time, I will simply post a statement by the Modernist painter, Paul Klee. This was originally published 1924 in Modern Artists on Art, and, I think, it is still as relevant as ever. For the Artist, communication with nature remains the essential condition. The artist is human; himself nature; a part of nature within natural space." May I use the simile of a tree? The artist has studied this world of variety,, and has, we may suppose, unobtrusively found his way in it. His sense of direction has brought order into the passing stream of image and experience. This sense of direction in nature and life, this branching and spreading array, I shall compare with the root of the tree. From the root the sap flows to the artist, flows through him, flows to his eyes. Thus he stands as the trunk of the tree. As in full view of the world, the crown of the tree unfolds and spreads in time and in space, so with his work. Nobody would affirm that the tree grows its crown in the image of its roots. Between above and below can be no mirrored reflection. And yet, standing at his appointed place he does nothing more that gather and pass on what come to him from the depths. He neither serves nor rules—he transmits. His position is humble. And the beauty at the crown is not his own. He is merely a channel. Something I think about quite a lot are the photographers that have shaped how we think, talk, and go about making photographs. I have been wanting to start a series that looks at certain "themes" and step back to look at the early influences of those ideas and themes and what they can teach us about the picture making experience, composition, printing. While they might not have agreed with being known as "masters of photography" their influence will last long into the future. I was in the middle of writing such a post tonight when I leaned that photography lost one of those modern masters today. Ray Metzker has passed away at the age of 83. His current show of unique gelatin-silver photographs, constructions, and works on paper—unique as in the only one in existence—is appropriately titled One and Only, and runs through October 25th at the Lawrence Miller Gallery in New York. Ray K. Metzker, American (b. 1931). 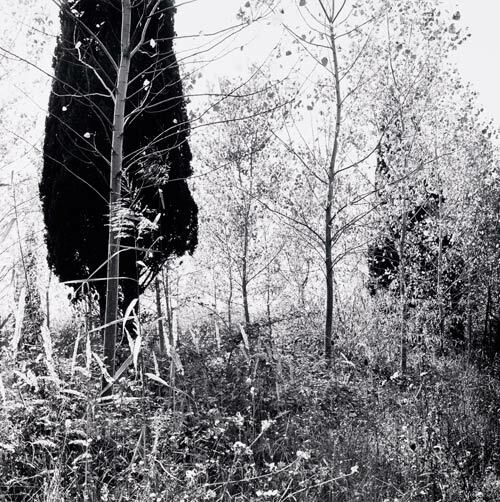 Feste di Foglie, Italy, 1985 © Ray K. Metzker, Courtesy of the Laurence Miller Gallery. Metzker's work is an example of how a photographic vision can continue to grow throughout the life of the artist as ideas are explored and expanded upon over a full career of genuine creativity. The tonal, structural, and temporal constructions in his earlier photographs and experimentations influenced his later straight photographs with the same sense of complexity and structural ambiguity. His book, LANDSCAPES, is one of my personal favorites, and influences in the way that it deals with light and the liveliness of trees. He came into photography during the fervent time of the 1960s, when the medium was still struggling to be "accepted" as a legitimate art form, and coming away from the "West Coast/East Coast/European" influences that began in the 1930s. In a way, his early photographs could only have been made at that time between the 1960s and 1970s. The techniques and spontaneity and delayed feedback allowed the photographers to create pictures in a much more freely than it is now possible. I doubt that the same kinds of photographs would be made with today—it is too easy to look at the back of the camera to see if you got it. It doesn't allow for as much discovery if you are always worried about "getting it". Additionally I doubt they would be recognized and valued in the same way if they were made today with todays digital technology and editing tools; the analogue techniques for creating those kinds of composites and multiple exposures were so much more difficult to do well, the digital equivalent might now just be seen as gimmicky and ineffective. In any case, the thing that drives masters of any medium is that they all set out to create work that is interesting to them personally, which is really what we respond to as viewers and why they will be remembered as great artists. Everyone is and can be creative. It is an innate trait stretching back to the first people who picked up a rock to use as a tool. Look at a toddler and tell me some people aren't born with creativity (it is everything else that gets in the way of creativity as we become adults). If it is impossible to create something new where nothing existed previously, then new things can only be created from the transformation and connection of existing things. In art it can be thought of as making connections between seemingly completely unrelated things or ideas. Prehistoric humans didn't create the rock or the bird they killed with it. They made the connection between the rock on the ground, the bird, and dinner in their belly. So what is creativity in the photographic sense? If all you are doing is creating things you've already visualized then the actually making of it becomes drudgery, and ultimately unrewarding. You can't learn to see anything new if all you are creating are the images floating around in your consciousness. Even less so if you are hampered by preconceptions, expectations, and rules. What IS rewarding, and what mastery allows for, is the ability to tap into the images floating around in you subconscious. It is getting to the mental/emotional space for your innate creativity to connect all those ideas and things you have previously seen into completely new ideas—new pictures. You can call it Zen, the Zone, Transcendence, etc. but all you have is yourself, a tool, and the thing in font of you. And it is up to you to get out of your own way and allow yourself to see the connection between them. Before I started this site and settled on the name BWMastery.com I thought long and hard about the perception people might have of me calling myself a "master" at this digital black and white stuff. I've always been one to run away from those calling themselves a guru of anything, and here I am with a site based on Mastery and telling people I can show them the path to it. So how is this site any different, and why should you not run away too (or come after me with torches and pitchforks)? Mastering something is essentially a process of learning something, applying it, measuring the results, and then recalibrating your perception and reaction to the thing in front of you. You do that again, and again, and again . . . until it becomes second nature. This process can be done on your own, but usually requires many years of practice, failing and learning. And even then, you might be missing something that a well-informed teacher or thoughtful critique could have corrected or tweaked earlier in the process. This is exactly why people seek teachers, seek mentors, and attend master-classes. For the most part, technique is easy, and refining the skills associated with any technique simply boils down to practice and knowing when to use the tool. So what exactly IS mastery in photography? I think it is like other creative pursuits where people talk about being "in the zone" when doing something—playing basketball, playing music, photographing. Mastery is the point where everything fades to the background and you can reach new creative heights. I think of it as state of being without friction. Photography—cameras, lights, printing in the darkroom, or digitally in photoshop—takes brain power, or bandwidth, as it's being referred to now. When you have to think about the process or technical aspects of what you are doing it takes bandwidth away from creativity. In the few posts I will address what I refer to as 'creativity' in regards to photographing and the editing process. Composition isn't formulaic. And pictures can't be boiled down to rules or turds, repetitive patterns, leading lines, or face in the dirt perspectives. People are often intimidated by the seemingly steep learning curve with digital photography, especially Photoshop.